Three dead whales were once on an almost permanent tour of the UK. 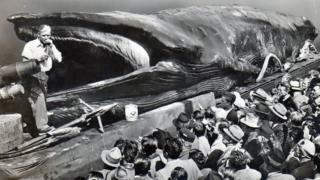 Throughout the 1950s, 60s, and 70s, thousands visited the preserved finbacks for both education and entertainment. So what is behind this unlikely whales' tale? As family days out go, striding through the corpse of a whale on the back of a lorry is a bit different to enjoying a theme park or traipsing around a National Trust stately home. But in their day, Goliath, Jonah and Hercules were hugely popular. Punters would pay an entrance fee before sauntering through the carcass in car parks and large grassy areas such as racecourses. The entrance was a doorway cut behind its head, and exited "through goodness knows what orifice," says Duncan Daniels, who saw one of them in Great Yarmouth when he was nine. In grisly juxtaposition, instruments of death such as the harpoon and other whaling tools were displayed next to the whale. Across England, visitors surged to goggle at the creatures, including at York, Coventry, Worcester, Bristol and Plymouth. Some who told their friends or family about their childhood encounter have found themselves disbelieved - or become convinced themselves it was merely a peculiar dream. "I went with my brother and my dad to see the whale on a lorry in the car park by Worcester police station in the 1950s," Jeremy Finch remembers. "My kids didn't think it happened. They teased me something rotten and I started to think it was all too strange to be true. We didn't take any pictures or anything. I don't think we had a camera. "It was all shiny and smelled funny." The whales had originally been caught off the coast of Norway and were initially driven around Europe to promote the whaling industry after World War Two. Eventually they were obtained by showmen, though, who, seeing their financial potential, gave them their biblical names and brought them to the masses. The whales were preserved and scooped out, their insides festooned with lanterns, and wildlife exhibits installed. Their arrival warranted news stories in the national press. Under the headline "The South Bank Whale", The Times reported in 1952: "Jonah, the Giant Whale, which is to be exhibited under Waterloo Bridge on the south bank from April 2, arrived from Dunkirk yesterday in a Dutch coaster. "The vessel docked at Dagenham and the 65ft rorqual was unloaded on to a 10-wheeled lorry which transports it on land. The whale had been touring Holland, Belgium, Germany and France since last September and has been kept in good condition by an internal refrigeration plant and daily injections of formalin." The size of the whales could present a logistical problem, though. "Jonah had to be unloaded at Dagenham because it had the only crane capable of lifting him," says Norman Williams, a dock worker. The whale later went on display in Oxford, where he could be viewed on the railway station forecourt. Jennifer Dart says she cycled to the station and could smell the whale - "a mixture of rotting and formaldehyde" - before seeing it. She was disappointed with it because it wasn't blue. "It was a sort of grey and looked a bit worse for wear, with sad, beady eyes". Attitudes toward animal welfare have changed over the years. The Calgary Herald, an Alberta newspaper, reported "sad news" in 1930 about a live whale due to go on show that had died on its way to the fairground. The sad news, though, was the disappointment faced by the "Calgary kids excited about the opportunity to see a real live 'sea elephant'". "Attendants of the massive beast were of the opinion that the altitude and heat of the day combined with the stress of the long fast run from Brandon caused the sea elephant's death." But Calgary kids managed to recover from their disappointment when organisers announced "the show must go on" and the 65-ton whale was embalmed and taken into the city by train. "Because of Goliath's size, he could not be moved from the rail car, so the marine exhibit was stationed at the eastern end of the grounds," the paper reports. Image caption The lorry bears an understated warning: "Attention. Special Transport"
Andy Hughes, who also saw the whale there, remembers putting his hand on the parts of the whale's mouth it uses to strain plankton out of seawater. He says it felt "like horsehair". However, Jonah, Goliath and Hercules were not the first whales to become a visitor attraction in the UK. In the 1930s, the more humbly-named Eric, a finback whale, toured England. He was eventually buried under Morecambe's rollercoaster. So what became of the other three? Goliath is thought to have ended up in Italy, but after that its trail goes cold. Hercules's adventures took him as far as a circus in Spain, before decomposition overwhelmed him and the circus went bust. He was disposed of in a giant furnace. And as for Jonah? There's a remote possibility we could see him on the road again. Steve Deput - who wrote a book about his efforts to track down the whale which he had seen as a boy in Barnsley - says the head of one of the UK's oldest circuses noticed the story and contacted him. "Mike Austen had actually driven the whale lorry around Europe. He couldn't tell me how Jonah had met his fate… he went one better. "Jonah still existed. He'd been in storage for the last 30 years in Holland and Belgium." The last Mr Deput had heard of Jonah is that he'd been bought by another showman and was being restored. So families may once again be able to abandon the humdrum pleasures of theme parks and stately homes in favour of prancing through the centre of a giant creature of the deep.